Many mice have two buttons and a scroll wheel. A computer mouse (plural: mice) is an input device that is most often used with a personal computer. Moving a mouse along a flat surface can move the on-screen cursor to different items on the screen. Items can be moved or selected by pressing the mouse buttons (called clicking). Today's mice have two buttons, the left button and right button, with a scroll wheel in between the two. It is called a computer mouse because of the wire that connects the mouse to the computer. The people who designed it thought that it looked like the tail on a mouse. 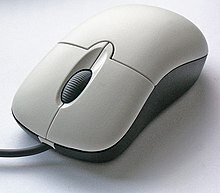 Today, many computer mice use wireless technology and have no wire.There are many types of mouse. Optical mouse, wireless mouse, mechanical mouse, trackball mouse. A computer mouse is a handheld hardware input device that controls a cursor in a GUI and can move and select text, icons,files,and folders. For desktop computers, the mouse is placed on a flat surface such as a mouse pad Or a desk and is placed in front of your computer. The picture to the right is an example of a desktop computer mouse with two buttons and a wheel. 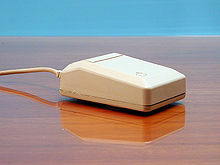 The mouse was originally known as the X-Y position Indicator for a display system and was invented by Douglas Engelbart in 1963 while working at Xerox PARC.However,due to Alto's lack of success, the first widely used application of the mouse was with the Apple Lisa computer. Today this pointing device is on virtually every computer.Move the mouse cursor- The primary function is to move the mouse pointer on the screen. Open or execute a program- once you've moved the pointer to an icon, folder, or other object clicking or double clicking that object opens the document or executes the program. Pointing to an item on the screen means moving your mouse so the pointer appears to be touching the item.when you point to something, a small box often appears that describes the item. In 1964 Douglas Engelbart (1925-2013), a researcher at Stanford Research Institute, wanted to find a way to make using computers easier. In those days, computers were large and expensive. Using them was very hard because everything had to be typed in on a keyboard. This command line interface is still used by some people, such as programmers, to get things done faster. After studying and designing for a long time, Engelbart succeeded in inventing an input device which he named 'XY index'. At first, it needed two hands to use, but it was changed so that only one hand was needed to use it. This model was more like the mouse that we use today, but was made up of a big ball that the user had to roll in different directions to move the cursor. The computer mouse began to be widely used when Xerox Palo Alto Research introduced a GUI in 1981, where the mouse was used to click things on the screen. This was also the case with the Macintosh operating system from Apple of Apple Inc when it came out in 1984, as well as Microsoft Windows. Windows became popular over the years, so over time computer mice became used with many computers. On most computers, the user can move the mouse to move the cursor in the same direction. To choose something that is on the screen, the user can move the cursor to it and "click" the left mouse button. The right button is used to open menus that are different depending on where the cursor is. The other mouse buttons can do different things, depending on the software. Most mice have two buttons to click. Most mice also have the "scroll wheel"—a small wheel found between the two main mouse buttons. The user can move the wheel back and forth to "scroll" through things like a website or folder. "Scrolling" means moving the words or pictures up or down on the screen, so another part of the page comes into view. The wheel can also be pressed, to click it like another button. A mouse can also be connected to and used the same way with a laptop computer, but unlike a desktop computer, one does not have to be connected to use the laptop. This is because along with the keyboard, laptops have a built-in input device called a trackpad which does the same thing as a mouse. Similarly, tablet computers have a touchscreen as an input device, but some, like the Microsoft Surface and those that use Android, also work with mice. ↑ "mouse from FOLDOC". foldoc.org. ↑ How computer mice work: "... the mouse hit the scene - attached to the Mac..."
↑ "WordNet Search - 3.1". wordnetweb.princeton.edu. This page was last changed on 4 March 2019, at 19:34.